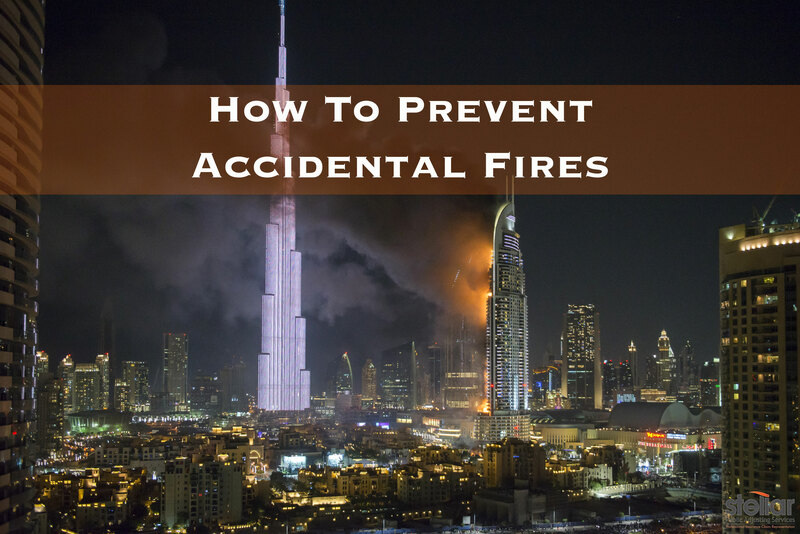 Lessons we learned from the massive New Year’s Eve fire in Dubai. The towering inferno that caught international attention on New Year’s Eve in Dubai was the stuff of nightmares. The blaze started in the evening on Thursday, December 31th in the Address Downtown, one of the most upscale hotel and residential skyscrapers in the city. By Friday afternoon, January 1st, there were still “cooling procedures” underway while small fires remained visible from within the building. 1. Assess: You need to keep sources of ignition and fuel apart. 2. Plan: Create an unobstructed escape plan. 4. Train: Practice how you will keep people safe in case of fire. 5. Review: Keep your fire risk assessment under regular review by doing things like checking fire alarms. Because, over time, your fire risks may change. Now is the time to review and update any fire safety precautions you may have in place for your property, so that you can prevent accidental fires. It is recommended that your fire risk assessment is undertaken by a qualified person that can suggest appropriate measures for you to take to help you prevent accidental fires. But, if you aren’t adequately prepared and disaster strikes, call Stellar Adjusting at (305) 570-3519 to help with any fire damage claims in South Florida.